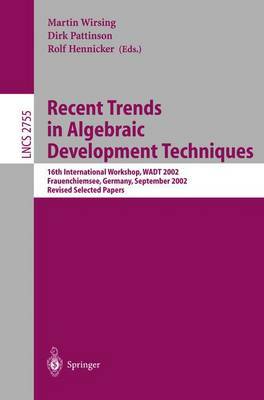 This volume contains selected papers from WADT 2002, the 16th International Workshop on Algebraic Development Techniques. Like its predecessors, WADT 2002 focussed on the algebraic approach to the speci?cation and development of systems, an area that was born around the algebraic speci?cation of abstract data types and encompasses today the formal design of software systems, new speci?cation frameworks and a wide range of application areas. WADT 2002 took place at the convent of Frauenchiemsee, Germany, on September 24-27, 2002, and was organized by Rolf Hennicker, Dirk Pattinson and Martin Wirsing. The workshop also included a special track on Formalism, Logic, Institution - Relating, Translating and Structuring (FLIRTS), and three satelliteevents:ameetingoftheIFIP WorkingGroup1.3onFoundationsofS- tem Speci?cation, a Workshop on Global Computing organized by the AGILE project, and a Workshop on Multimedia Instruction in Safe and Secure Systems (MMISS). The program consisted of invited talks by Egidio Astesiano (Genoa, Italy), Andrew Gordon (Cambridge, UK), and Jan Rutten (Amsterdam, The Neth- lands), and 44 presentations describing ongoing research on main topics of the workshop: formal methods for system development, speci?cation languages and methods, systems and techniques for reasoning about speci?cations, speci?- tion development systems, methods and techniques for concurrent, distributed and mobile systems, and algebraic and co-algebraic foundations.